My first year as a teacher, I was a paid intern. In the State of California, schools can hire teachers that aren’t fully licensed, so long as they are in the process of getting their credential. In my case, all of that training teachers get before they are in charge of their own classrooms, I wasn’t educated to the level of a first-year teacher. I was learning to build the boat while casting off to sea. So, at the start, I was already behind. But I thought I knew enough to get started. Boy, did I have a lot of learning to do. So, when my site offered PD, I did my best to soak it up, but they were sharing the same insights I was getting in my credential program. Sometimes the presentations were good, but most of the time it was mediocre. And I did have to sit through some really bad PD as well. If you’re PD experience was anything like mine, there is hope for you! In the next section, I’m going to share the four signs that may show that you may lack development as teacher and what you can do about it. The Four Signs Your Development as a Teacher May Be Delayed. Below I will describe some of my experience with Professional Development over the past 13 years, which I think has contributed to my stunted growth. After that, I will give you a peak into five different ways I have come from behind to catch up, five things you can start doing tomorrow to get better. 1. Your PD planners and presenters assume what you need to know. If I were to string together all the hours that I have attended PD, most of them were framed where those attending needed to know whatever the presenter is sharing. And there have been times where I truly needed to know something that was presented, but I have had plenty of experiences where the presentation wasn’t a benefit for me at all. It may have been for a select few in the audience, but many people had either had this training before or they were well-versed in the ins and outs of the topic. And that’s how these “presenter knows best” approaches seem to go: they only apply to about 30% of those in the room. The worst ones are when it is PD for everyone instead of disciplinary action for the three faculty members that are resisting some sort of needed change. 2. Most of your PD is One-Size-Fits-All. Cleverly disguised as a staff meeting, your stuck in a big room with your whole site who either teach completely different subjects and/or grade-levels than you. It will be on a topic like “differentiated instruction,” which is a great element of teacher practice that teachers need training in. However, the applications of differentiated instruction are so varied and subject specific, there is no way to make this apply to everyone at the meeting. In my experience, presenters will maximize the time discussing the principles and then minimize the time demonstrating application. The application is also narrow, like a math concept/problem. 3. Most, if not all, of your PD is at the beginner-level. I have attended PD where the topic was energizing. I was looking forward to a deep dive into a given instructional strategy or tech tool, only to walk away disappointed because we only scratched the surface of the application. I have attended training with tech where the allotted time only allowed us to create a username, a password, and set up elements of our profile. That’s it! Many times when this happens, it’s clear that there are several teachers in the audience who could take that presentation much further. I wish someone would ask those expert teachers to lead a break-out session half way through for either (1) the more advanced learners, or (2) in subject-specific areas. 4. Most of your PD presenters have been the “Sage on the Stage.” Most of time, presenters are the know-it-alls in front of the group, or at least that’s the way that it’s they come across. They present the material–usually run through a poorly designed PowerPoint with way too much text on each slide–then they field questions only about the content they presented (which teachers tend to use as a platform to complain about something they have been asked to do). This may not be the presenter’s fault either, it could be the design of the space where the PD is taking place (Is it only set up for lecture, with seats in rows facing a front? What’s the lighting like, dark?). 1. Attend Conferences. These have been going on forever. There are probably two or three that will be held within driving distance from your house this next year. It’s never been easier to find information about these events with the internet, so find them and attend. If you can get your district or site to pay for your registration, great! If not, pay your own way. Having to pony up that fee on your own will make you sit up a little straighter and get more out of your experience. 2. Read Books. There are great books out there written by those still in the trenches (and by that I mean teachers in the classroom). See what the latest research says. Discover a whole host of strategies. If you’re looking to improve your general practice as a teacher, there are plenty of options. But if you’re looking for something in a particular niche, there are even more of those. 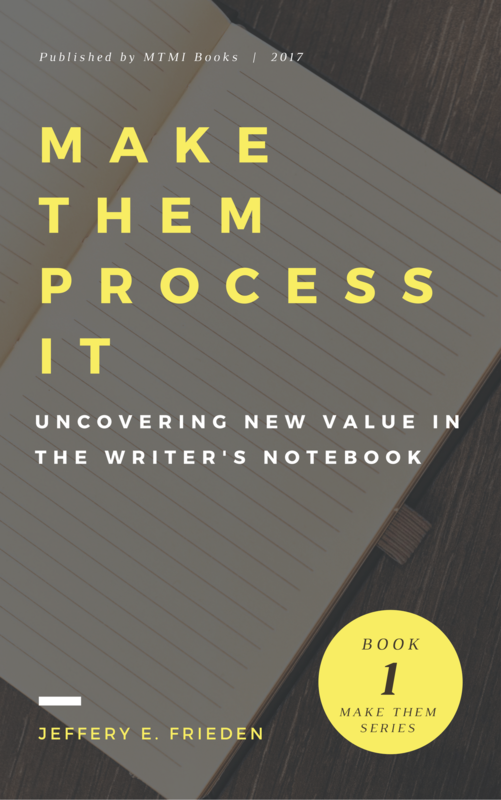 Hypothetically speaking, you may be looking for a little more insight about using a Writer’s Notebook with your students, so, I don’t know, maybe you look here. If you want more, then a good place to start is the Education Podcast Network. 4. Take an Online Course. This approach is growing in popularity, especially if you’re more introverted and the concept of networking at a conference made you anxious. This is like a conference on video. Great teachers are taking their best practices and teaching others how to use them in their classroom. This past semester, I took Dave Stuart Jr’s Student Motivation Course, and it was awesome! Not only did he whittle down all of his insight from all the research his done, he distilled it into “use it in your classroom tomorrow” applications. And, if you have ever walked away from a great PD and thought, “I wish I could go back and hear it all over again,” Well, now you can! 5. Build Collaboration Online. I am just a beginner at this one, but the applications for social media in the teacher-space is getting really interesting. There are all kinds of ways teachers are engaging other teachers online and learning from one another. If you’re looking to learn more about certain instructional strategies, there may be a Facebook group for that (like, I don’t know, a Writer’s Notebook). I plan to go gradeless next year, but I’m going to need a lot of support. The people at my site aren’t doing this, so I have joined the TG2 Facebook Group. I have posed several questions there and received some great replies! There are Twitter hashtags out there that are great to follow. If you throw a question out there with the right hashtag, the teacher collaboration on Twitter is so great, several teachers are bound to answer it. With Twitter, you can just ask a teacher-writer a direct question. I was confused about something I read in Kelly Gallgher’s Write Like This, so I just snapped a pic and sent him the question. Not only did he respond, at least one other teacher jumped in and further clarified the concept! Follow blogs (like this one). As topics trickle in that you care about, you will get linked with a lot of other resources. Now that you know what’s out there, it’s up to you to take your professional development to the next level! What are you waiting for?